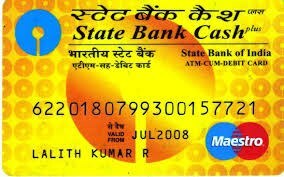 State Bank of India is now going to block old insecure ATM cards and if you have old ATM card without EMV CHIP then its time to apply for the new EMV CHIP Based Debit Card. “All esteemed customers of State Bank of India are hereby informed that it has been decided by the Bank that all the magstripe Debit Cards which are in blocked state as on 28-Feb-2017 and to all such requests for blocking thereafter will remain blocked permanently. Instead free EMV Chip Cards have to be issued to them. The affected cardholders are to be advised to apply for replacement EMV Chip Card through internet banking or by approaching their home Branch,” notes a statement posted on the bank’s site. Yo can apply for new Debit card through net banking or by visiting your branch. The new card will be issued without any charge. SBI is going to block those ATM / Debit Card which is quite old & does not have EMV CHIP. Check out the ATM / Debit Card below, there is no EMV CHIP in it. Such debit cards will now be blocked. Now check out this new EMV Chip based SBI Global Debit Card. You can see the EMV CHIP which is on the front of the card as you can see below. EMV (Europay Mastercard VISA) – a new technology that has been used in today’s Debit Card & Credit Card. EMV Cards contain a Microprocessor Chip that protects your card information. Nobody can steal your information. The old ATM Card, which does not have such chip, keeps the risk of stolen card data. SBI last year was hit by a massive cyber attack, compromising nearly 32 lakh ATM cards. 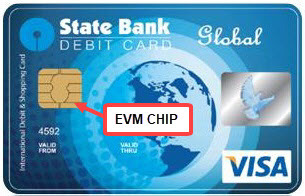 If you have an ATM / Debit card without EMV Chip, then block it and then apply for the new EMV Chip ATM Card. If you have SBI Internet Banking facility then you can apply online for Debit Card and your card will be delivered at your doorstep via post. You can apply any ATM card which are mentioned above. As i said, issuance charges are free and you have to pay nothing.